Ischemia/reperfusion leads to inflammation and oxidative stress which damages membrane highly polyunsaturated fatty acids (HPUFAs) and eventually induces neuronal death. This study evaluates the effect of the administration of Pistacia lentiscus L. essential oil (E.O. ), a mixture of terpenes and sesquiterpenes, on modifications of fatty acid profile and endocannabinoid (eCB) congener concentrations induced by transient bilateral common carotid artery occlusion (BCCAO) in the rat frontal cortex and plasma. Adult Wistar rats underwent BCCAO for 20 min followed by 30 min reperfusion (BCCAO/R). 6 hours before surgery, rats, randomly assigned to four groups, were gavaged either with E.O. (200 mg/0.45 ml of sunflower oil as vehicle) or with the vehicle alone. BCCAO/R triggered in frontal cortex a decrease of docosahexaenoic acid (DHA), the membrane highly polyunsaturated fatty acid most susceptible to oxidation. Pre-treatment with E.O. prevented this change and led further to decreased levels of the enzyme cyclooxygenase-2 (COX-2), as assessed by Western Blot. In plasma, only after BCCAO/R, E.O. administration increased both the ratio of DHA-to-its precursor, eicosapentaenoic acid (EPA), and levels of palmytoylethanolamide (PEA) and oleoylethanolamide (OEA). Acute treatment with E.O. 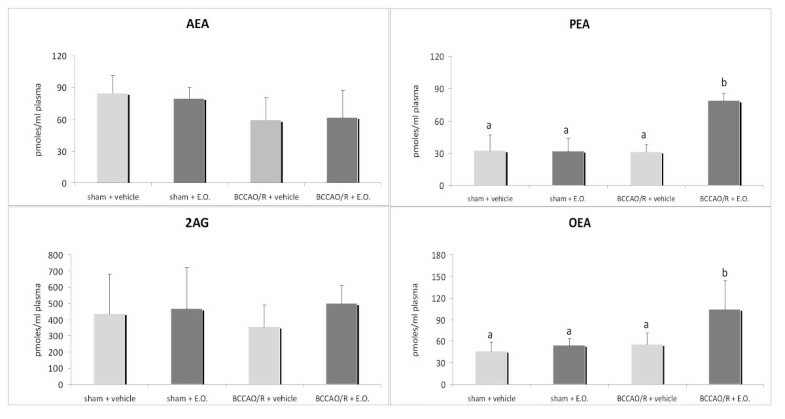 before BCCAO/R elicits changes both in the frontal cortex, where the BCCAO/R-induced decrease of DHA is apparently prevented and COX-2 expression decreases, and in plasma, where PEA and OEA levels and DHA biosynthesis increase. It is suggested that the increase of PEA and OEA plasma levels may induce DHA biosynthesis via peroxisome proliferator-activated receptor (PPAR) alpha activation, protecting brain tissue from ischemia/reperfusion injury. Cerebral ischemia or stroke is often associated to unilateral or bilateral occlusion of internal carotid artery or common carotid artery [1–4]. Interruption of brain circulation makes the cerebral tissue unable to sustain basal metabolism and within a few seconds leads to multiple interconnected pathophysiological events affecting the structural and functional organization of brain tissue [5, 6]. Although reperfusion of neural ischemic tissue is desirable, the post-ischemic reestablishment of blood supply leads to a general impairment of translation capability, oxidative stress and free radical formation which can eventually cause neuronal death [6–8]. Neuronal membranes are particularly rich in highly polyunsaturated fatty acids (HPUFAs) which serve as reservoirs of biologically active lipids in physiological conditions, whereas, in stressful circumstances, are target of free radical-mediated lipid peroxidation whose products, in turn, can injure the brain [9–11]. The brain has a unusual ability to preserve the neuronal membrane concentration of HPUFAs within a physiological range ; however, it is also particularly vulnerable to oxidative stress due to the presence of uniquely high content of HPUFAs, of an inadequate antioxidant defense system and of high mitochondrial density [10, 11]. Ischemia/reperfusion may affect lipid turnover and cause the release of free (unesterified) PUFAs from membrane phospholipids . The main products of lipid peroxidation are fatty acid hydroperoxides which are quite unstable and capable to propagate free radical reactions, thus extending the damage . Interestingly, recent studies point up the relationship between brain metabolic stress and lipid peripheral dysregulation, showing that cleavage and immediate release of membrane lipid precursors, such as eicosanoids, could be useful indicators of central nervous system (CNS) pathologies . In addition, plasma lipid metabolic alterations as a physiological response to brain ischemic stimulus are triggered by ischemia/reperfusion during carotid endoarterectomy in patients with carotid stenosis  and endocannabinoid (eCB) plasma levels have been shown to increase in patients with acute ischemic stroke . Epidemiological studies indicate that oxidative stress and neuroinflammation are also factors associated with the decline of function in the aging brain  and that the regular consumption of natural products rich in bioactive compounds is associated with vascular diseases, stroke and dementia risk reduction [18–22]. Although the mechanisms through which these compounds exert beneficial effects wait to be clarified, their antioxidant, free radical scavenging and anti-inflammatory properties are supported by different experimental data [19, 21–25]. The Pistacia lentiscus L. plant is an aromatic bush indigenous to Italy and other Mediterranean and Middle East countries. Its extracts have found extensive use in folk medicine for their anti-hypertensive, anti-inflammatory and antiseptic properties and for the treatment of gastric disorders . To our knowledge, the bioactive properties of P. lentiscus L. extracts and/or individual components have been reported only by in vitro studies where, with different analytical methods, it has been shown that they have a strong antioxidant activity [25, 27–33]. Previous analyses of P. lentiscus L. essential oil (E.O.) showed a characteristic composition with relatively high concentration of terpenes and sesquiterpenes [27–33], for some of which a potent anti-inflammatory activity has been shown in different experimental rodent models [21, 22, 34–36]. Because of the low extraction yield from P. lentiscus L. plant, the E.O. under study has not generally received much attention for its application in pharmaceutics and has little commercial use. We sought to investigate the potentially neuroprotective in vivo effects of dietary E.O., obtained by Supercritical Fluid Extraction (SFE), in a rat model of hypoperfusion achieved by transient bilateral common carotid artery occlusion (BCCAO) followed by reperfusion (BCCAO/R). This study reports on modifications of fatty acid profile and eCB congener concentrations induced by BCCAO/R in the rat frontal cortex and plasma, and shows that lipid metabolic changes are apparently prevented by the administration of E.O.. Expression of the enzyme cyclooxygenase-2 (COX-2) is also examined by Western Blot on the same brains. Leaves of P. lentiscus L. were collected during full blossom in northern Sardinia (Italy). Highest purity solvents and reagents included Folin-Ciocalteu reagent, methanol, hydrochloric acid (37%), ferric chloride, sodium acetate trihydrate and sodium acetate 6-hydrate (Merck, Darmstadt, Germany); 1,1-Diphenyl-2-picrylhydrazyl radical (DPPH, 98%) and gallic acid (99%) (Sigma-Aldrich, Steinheim, Germany); sodium carbonate anhydrous and 2,4,6-tris(2-pyridyl)-S-triazine (TPTZ, P99%) (Fluka, Buchs, Germany); glacial acetic acid (SDS, Penien, France); dichloromethane (Lab-Scan, Dublin, Ireland). Chemical constituents of the oil were identified by comparison with reference compounds [Fluka, Acros Organics (Geel, Belgium); Sigma-Aldrich]. Supercritical CO2 (SFE) extractions were performed in a laboratory apparatus, equipped with a 320 cm3 extraction vessel and two separator vessels of 300 and 200 cm3, respectively, connected in series . Experiments were carried out at P = 90 bars, T = 50°C and ϕCO2 = 0.6 kg/h. In the first separator the temperature was set at -10°C and the pressure at the same value as the extraction section. The second separator was set at 10°C and 15 bars. Extraction was carried out in a semi batch mode: batch charging of vegetable matter and continuous flow solvent. About 180 g of material were charged in each run. Analysis of essential oil was carried out by gas chromatography (GC) and by gas chromatography-mass spectrometry (GC-MS). Analytical GC was carried out in an Agilent 6890 gas chromatograph (Agilent Technologies, Palo Alto, CA, USA) with HP GC ChemStation data handling system, equipped with a single injector and two flame ionization detectors (FID). A Graphpak divider (Agilent Technologies) was used for simultaneous sampling to two Supelco fused silica capillary columns (Supelco Inc., Bellefonte, PA, USA) with different stationary phases: SPB-1 (polydimethylsiloxane 30 m × 0.20 mm I.D., film thickness 0.20 μm) and SUPELCOWAX 10 (polyethylene glycol 30 m × 0.20 mm I.D., film thickness 0.20 μm). Oven temperature was settled at 70°C, raising at 3°C min-1 to 220°C and then held 15 min at 220°C; injector temperature: 250°C; carrier gas: helium, adjusted to a linear velocity of 30 cm/s; splitting ratio 1:40; detector temperature: 250°C. GC-MS analyses were carried out in an Agilent 6890 gas chromatograph fitted with a HP1 fused silica column (polydimethylsiloxane 30 m × 0.25 mm I.D., film thickness 0.25 μm), interfaced with an Hewlett Packard mass selective detector 5973 (Agilent Technologies) operated by Agilent Enhanced ChemStation software. GC parameters as above; interface temperature: 250°C; MS source temperature: 230°C; MS quadrupole temperature: 150°C; ionization energy: 70 eV; ionization current: 60 μA; scan range: 35-350 u; scans/sec: 4.51. The identity of the components was assigned by comparison of mass spectra and retention indices for two different chromatographic stationary phases calculated by linear interpolation to the retention of a series of n-alkanes. Experimental data were compared with corresponding data of reference oils and commercial available standards banked at a home-made library or from literature data [38, 39]. Percentages of individual components were calculated based on GC peak areas without FID response factor correction. Composition of the E.O. is reported in Table 1. The total essential oil yield, after an extraction lasting 4 hours, was 0.14% and the main constituents included germacrene D (19.9%), beta-caryophyllene (BCP) (6.6%), alpha-pinene (6.3%), myrcene (3.9%), beta-phellandrene (3.7%) and alpha-humulene (2.4%). Sixteen male Wistar rats (Harlan-Italy, Udine, Italy ), weighing 210 ± 20 g (mean ± SD) were housed in an environment of controlled temperature (21 ± 2°C), relative humidity (60 ± 5%) and under an artificial 12 h light/dark cycle for 1 week before the experiment set off. All stressful stimuli were avoided. Animal care and handling throughout the experimental procedures were in accordance with the European Communities Council Directive of 24 November 1986 (86/609/EEC). The experimental protocols were also approved by the Animal Ethics Committee of the University of Cagliari. Standard laboratory food (Safe A04, France) and water were freely available ad libitum. Animals were starved for 12 hours before surgery and 6 hours prior to ischemia the E.O. was administered by gavage. Due to the lack of data in the literature on the use of E.O. in vivo, choice of the dose was based on the concentration of some of the E.O. components, such as BCP and alpha-humulene (Table 1), whose effectiveness as single agents has been reported [34–36]. Since these molecules have been shown to be active in contrasting the symptoms of different models of inflammation in the range of 5 to 100 mg/kg bodyweight [34–36], in the present study each rat was administered 200 mg of E.O. (containing about 60 mg/kg bodyweight of BCP and 22 mg/kg bodyweight of alpha-humulene) in 0.45 ml of sunflower oil as vehicle. Rats were randomly assigned to four groups, those submitted to BCCAO/R and the sham-operated ones, treated with the vehicle alone or with the vehicle containing the E.O.. Surgery was performed in all cases between 15:00 and 17:30 p.m.. Rats were anesthetized with intraperitoneal administration of chloral hydrate (80 mg/ml; 0.5 ml/100 g bodyweight). After a midline cervical incision and blunt dissection of muscles, the right and left common carotid arteries (CCA) were exposed while leaving the vagus nerve intact. Transient bilateral ligation of CCA, performed with a 0.28 mm nylon fishing line, lasted 20 min. Blood flow was then restored through the stenosed vessels for 30 min. Sham operated rats underwent a surgical procedure similar to the other groups but without the CCA occlusion. These animals made up the control group used to determine the effects of anaesthesia and surgical manipulation on the results. At the end of the procedure, the animals, still anesthetized, were sacrificed and different brain areas, i.e. olfactory bulb, telencephalic cortex (subdivided in an anterior third, including the frontal cortex, and the remaining posterior two thirds, including parietal, temporal, and occipital cortex), hippocampus, hypothalamus, striatum, brainstem and cerebellum were rapidly dissected out and frozen at - 80°C until fatty acid or western blot analysis. Blood was collected from the trunk of killed rats into heparinised tubes and centrifuged at 1500 g for 10 min at - 8°C. The resulting plasma was frozen at - 20°C until assayed for lipids. Total lipids were extracted from different brain areas and plasma using chloroform/methanol 2:1 (v/v) . Aliquots were mildly saponified as previously described  in order to obtain free fatty acids for high-performance liquid chromatography (HPLC) analysis. Separation of fatty acids was carried out with an Agilent 1100 HPLC system (Agilent, Palo Alto, Calif., USA) equipped with a diode array detector as previously reported . N-arachidonoylethanolamide (AEA), 2-arachidonoyl-monoacylglycerol (2-AG), palmitoylethanolamide (PEA) and oleoylethanolamide (OEA) were extracted from tissues and plasma, purified and analysed as previously described . One-way ANOVA and the Bonferroni test for post hoc analyses were applied to evaluate statistical differences among groups. Tissue homogenates were prepared in 2% sodium dodecyl sulphate (SDS). Protein concentrations were determined using the Lowry method of protein assay  with bovine serum albumin as standard. Proteins for each tissue homogenate (30 μg), diluted 1:1 in loading buffer, were heated to 95°C for 10 min and separated by SDS-polyacrilamide gel electrophoresis (SDS-PAGE) using a 12.5% (w/v) polyacrylamide resolving gel. Internal mw standards (Kaleidoscope Prestained Standards, Bio-Rad, Hercules, CA, USA) were run in parallel. Two gels at a time were run for Coomassie staining and immunoblotting, respectively. Proteins for immunoblotting were electrophoretically transferred on a polyvinylidene fluoride membrane (Bio-Rad) using the Mini Trans Blot Cell (Bio-Rad). Blots were blocked by immersion in 20 mM Tris base and 137 mM sodium chloride (TBS) containing 5% milk powder and 0.1% Tween 20 (TBS-T), for 60 min at room temperature and incubated overnight at 4°C with rabbit polyclonal antibody against COX-2 (residues 570-598) (Cayman Chem., USA), diluted 1:200 in TBS containing 5% milk powder and 0.02% sodium azide (NaN3) (Sigma-Aldrich, Steinheim, Germany), was used as primary antiserum. After TBS-T rinse, blots were incubated for 60 min, at room temperature, with peroxidase-conjugated goat anti-rabbit serum (Sigma Aldrich), diluted 1:10,000 in TBS/T. Loading controls for equal loading of the wells were obtained by stripping and immunostaining the membranes as above, using a mouse monoclonal antibody against the housekeeping protein glyceraldehyde 3-phosphate dehydrogenase (GAPDH) (Chemicon), diluted 1:1,000, as primary antiserum, and a peroxidase-conjugated goat anti-mouse serum (Chemicon), diluted 1:5,000, as secondary antiserum. In order to control for non specific staining, blots were stripped and incubated with the relevant secondary antiserum. After TBS-T rinse, protein bands were visualized on a film (Kodak X-Omat LS, Kodak, Rochester, NY) using the ECL method (Amersham Corp.). Approximate molecular weight (mw) of immunolabelled protein bands and relative optical densities (ODs) were quantified using a GS-800™ Calibrated Densitometer with Quantity One 1 analysis software (BIO-RAD Hercules, CA, USA) by comparing the position of relevant bands on the autoradiograms with those of the prestained standard mw or with those of the GAPDH bands, respectively. The ratio of the intensity of COX-2 bands to the intensity of GAPDH bands was used to compare expression levels of these proteins following E.O. administration. One-way ANOVA and Fisher's test for post hoc analyses were applied to evaluate statistical differences among groups. 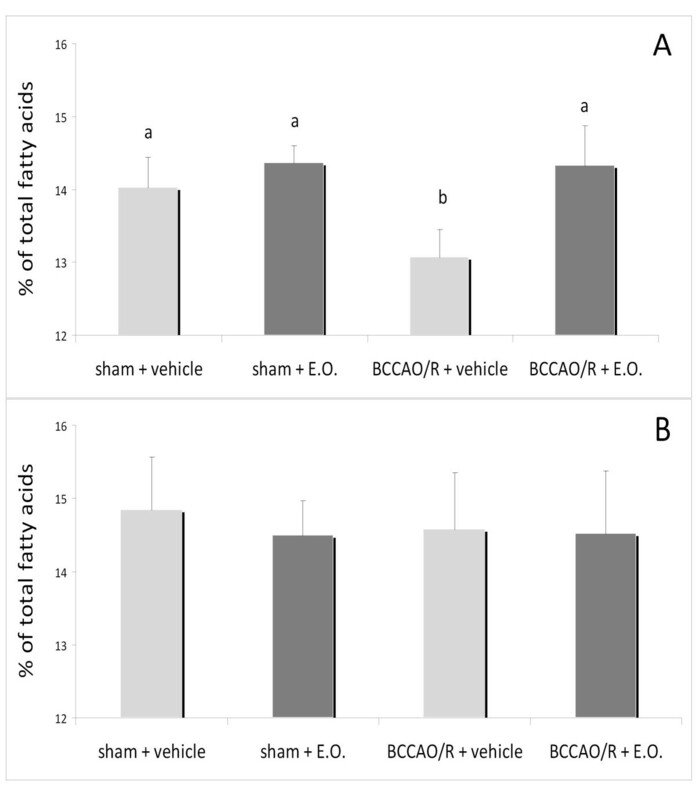 Analysis of the frontal cortex (Figure 1A) and the remaining posterior cortex (Figure 1B) showed that, in vehicle-treated rats, BCCAO/R affected fatty acid concentration by causing about 10% decrease of DHA in the frontal cortex (Figure 1A). No changes were detected in the remaining posterior cortex (Figure 1B). By contrast, no significant changes were evident in rats pre-treated with E.O. and submitted to BCCAO/R as compared with other groups (Figure 1). Analysis of eCBs and congeners revealed no changes either after BCCAO/R or E.O. pre-treatment (data not shown). 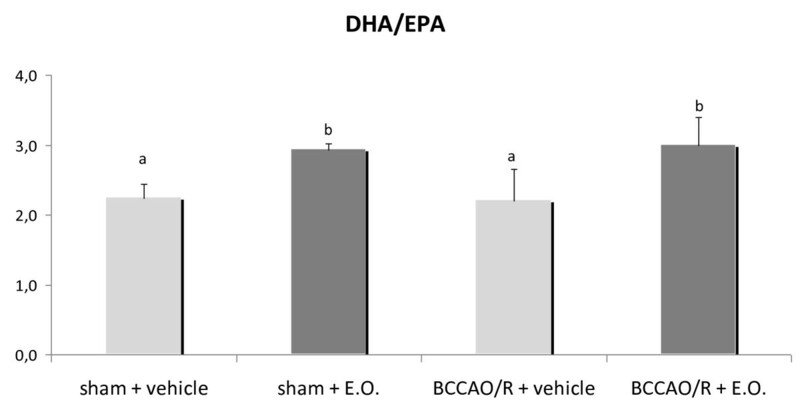 DHA concentration, expressed as mol% of total fatty acids, in frontal (A) and posterior cortex (B) of rats submitted to sham operation and to BCCAO/R, pre-treated either with the vehicle alone or with the E.O.. Error bars depict standard deviation. Different letters denote significant differences (p < 0.05). In order to verify whether there was a peripheral supply of DHA, we also measured levels of DHA and its precursor EPA in plasma. In rats pre-treated with E.O. whether or not submitted to BCCAO/R, an increase in the DHA-to-EPA ratio (p < 0.05) was observed (Figure 2). Analysis of eCBs and congeners revealed that levels of PEA and OEA increased significantly in rats pre-treated with E.O. and submitted to BCCAO/R (Figure 3) compared to the vehicle-fed ones, whereas no change was observed in levels of AEA and 2-AG. DHA/EPA ratio in plasma of rats submitted to sham operation and to BCCAO/R, pre-treated either with the vehicle alone or with the E.O.. Error bars depict standard deviation. Different letters denote significant differences (p < 0.05). 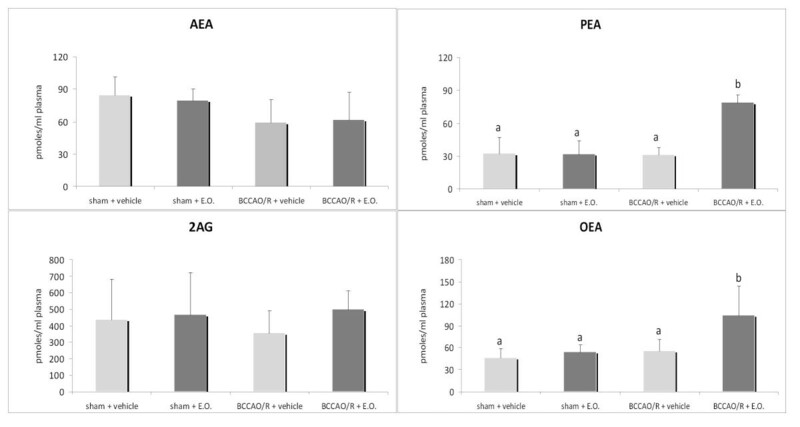 AEA, PEA, OEA and 2-AG concentrations, expressed as pmoles/ml, in plasma of rats submitted to sham operation and to BCCAO/R, pre-treated either with the vehicle alone or with the E.O.. Error bars depict standard deviation. Different letters denote significant differences (p < 0.05). In the frontal cortex homogenate, the staining intensity of the COX-2 protein band decreased significantly (p < 0.05) after pre-treatment with E.O. in the rats submitted to BCCAO/R, as compared with the vehicle-fed rats submitted to BCCAO/R (Figure 4). By contrast, no changes were observed between vehicle-fed rats, both after BCCAO/R or after sham operation. (A) Western blot analysis of COX-2 in the frontal cortex of rats submitted to sham operation and to BCCAO/R, pre-treated either with the vehicle alone or with the E.O. (B) Relative levels of COX-2 expression with densitometric analysis of the gray levels expressed as a percentage of the optical density (O.D.) ratio of the COX-2-positive bands to the GAPDH-positive ones. Error bars depict standard deviation. Different letters denote significant differences (p < 0.05). The present results show that BCCAO for 20 min followed by reperfusion for 30 min is apt to induce a weak but reproducible insult which resulted in a decrease of DHA and a parallel increase of COX-2 expression in frontal cortex, without any appreciable change in tissue morphology. This model has proved to be useful to test E.O. effects in the early phase of BCCAO/R, before other factors may intervene triggering a range of physiological responses to preserve structural lipid changes. Previous studies reported failure of this model to achieve a reproducible ischemic insult in the rodent brain due to the presence of efficient collateral systems, which allow for a cerebral blood flow compensation within a few minutes [45, 46]. Results obtained show that this model triggers a cerebral insult sufficient to cause a detectable, significant decrease in the tissue level of DHA, the most abundant essential fatty acid of neuronal membrane phospholipids . DHA is particularly susceptible to lipid peroxidation [48, 49] and, for this reason, potentially apt to contribute to hypoperfusion/reperfusion-induced oxidative stress. However, several lines of evidence have associated increased levels of DHA to tissue protection in neuroinflammation  suggesting that DHA does not increase susceptibility to oxidative stress. Data in rodents and healthy humans support this inferring, as dietary supplementation with n-3 PUFAs does not affect lipid peroxidation [51, 52]. DHA is an agonist of peroxisome proliferator-activated receptor (PPAR) alpha . Though mechanisms certainly need further investigation, it can be suggested that PPARalpha, in turn, may act to attenuate the neuroinflammatory reaction either by increasing the rate of peroxisomal beta-oxidation or by slowing/suppressing nuclear factor-kappaB (NF-kB) activity and thereby slowing the activity of phospholipases and COX-2 . The present findings demonstrate that just a single dose of E.O. is sufficient to influence tissue metabolism in response to BCCAO/R challenge. The BCCAO/R-induced decrease of DHA, most likely due to its breakdown during lipid peroxidation, was totally prevented by the pre-treatment with E.O.. The observation that DHA/EPA ratio raises after BCCAO/R following pre-treatment with E.O. may lead to suggest that there is an increased metabolism of n-3 which may supply damaged brain tissue with newly produced DHA. On the other hand, the increase of DHA/EPA ratio might be explained by an augmented entry of EPA in the brain parenchyma to be promptly metabolized to DHA [55, 56]. Thus, in keeping with the protecting role of DHA in neuroinflammation , it is tempting to speculate that pre-treatment with E.O. affects the outcome of the BCCAO/R-induced events by modulating the tone of DHA precursors in the brain. In this way, the sparing of DHA from lipid peroxidation may contribute to minimize the extent of the BCCAO/R-induced inflammatory reaction and to help preserving the brain structure. The lower expression of COX-2 detected after BCCAO/R following pre-treatment with E.O. compared to the treatment with the vehicle alone further supports this hypothesis. In fact, upregulation of COX-2 mRNA and protein, though not always predictive of harmful effects [57–60], is induced by ischemia and plays a role in the ischemic brain injury [59, 61–65]. Conversely, selective COX-2 inhibition ameliorates brain damage and prevents neuronal death after ischemia . An increase of eCB plasmatic levels has been shown in several experimental models of ischemia . In addition, in human stroke patients, an increase of PEA plasmatic levels in early phases of ischemia has been demonstrated to be significantly correlated with neurological disability . In the present study PEA and OEA are increased only in BCCAO/R rats pre-treated with E.O.. Whether and how E.O. administration may trigger an increase of PEA and OEA plasma levels remains to be elucidated. As it has been suggested that brain damage "spill over" effect may contribute to eCB and congeners plasma levels , it would be further interesting to establish if E.O. may cause or modulate brain "spill over" in these conditions. On the other hand, it has been widely demonstrated that PEA has important pharmacological effects in a wide range of experimental models of inflammation [68–70]. In particular, it is possible that PEA may exert neuroprotective effects by preventing mast cell degranulation , activating PPARalpha  and dumping COX-2 expression . It could be speculated that the augmentation of peripheral PEA might represent the key factor for enhancing PUFA metabolism via PPARalpha activation, protecting brain from ischemia/reperfusion injury. Interestingly, exogenous administration of PEA in an acute stroke model is effective in reducing the infarct size . Moreover, in human stroke eCBs and congeners become detectable in relation to the acute phase of ischemic stroke  where they may play a role through multiple potential mechanisms . Previous studies tested the anti-oxidant, anti-microbial and anti-inflammatory activities of the Pistacia lentiscus L. gum or fixed oil [25, 27, 28, 32, 33]. However, to our knowledge this is the first report on the effect of in vivo administration of Pistacia lentiscus L. essential oil. Therefore, identification of the E.O. constituent(s) that may exert the beneficial effect in cerebral hypoperfusion/reperfusion remains an issue worth further investigations. A possible candidate is BCP, present in relatively high concentration in the E.O., which has been shown to elicit anti-inflammatory effects typical of non-steroidal agents in rat models of inflammation [34–36] and to exert cannabimimetic effects in vivo [20, 21]. In addition, potential synergistic effects may be produced by other E.O. components, such as alpha humulene, germacrene D, gamma-cadinene, present in relatively high concentrations in E.O., for which antioxidant and antinflammatory activities have been also demonstrated [20, 25, 35]. Treatment with E.O. may prevent early neuroinflammatory events by protecting brain tissue DHA from oxidative degradation, possibly allowing an attenuation of signal transduction pathways which lead to increased susceptibility to neuroinflammation. This effect may be mediated by synergistic actions at peripheral and cerebral tissue level. Whether changes in brain and plasma fatty acid metabolism are directly interrelated to availability and modifications of PEA and OEA concentration in plasma is a suggestive issue worth to be further investigated. Marina Quartu, Maria P Serra contributed equally to this work. The authors gratefully acknowledge funding from the Regione Autonoma della Sardegna "Green Chemistry" Cluster Project and the Fondazione Banco di Sardegna. MQ and SB conceived the study, participated in its design and coordination, draft and wrote the manuscript; MPS conceived and participated in the design of the study, carried out the protein analysis and elaborated the data; MB carried out the tissue sampling and performed the statistical analysis of western blot data; GP and TM performed the surgery; LP helped in the statistical analysis; MDF gave critical contribution to the manuscript; DF performed the SFE; GC and EM, participated in the design of the study, performed the eCB analysis and elaborated the data; LC and AP performed the fatty acid analysis and elaborated the data. All authors read and approved the final manuscript.